We’d love your help. Let us know what’s wrong with this preview of Seaside and Homicide by Jenna St. James. When high school seniors, Brynn O'Connell, and her best friend, Peyton Patterson, discover a dead body during the Copper Cove Festival, they had no idea their lives would forever change...for the better. Standing next to the victim is the strange new girl in town, Raven Masters. When Brynn identifies the murder weapon as belonging to her Grams, the three girls set out to prove Granny Winnie is no killer! Brynn and Peyton must learn to set aside their prejudices and trust the quirky new girl. After all, she seems to be an old pro at sleuthing. Of course, it doesn't hurt that the girls get to cut their sleuthing teeth in Raven's cool '66 Fastback Mustang. But when things go from bad to worse for Granny Winnie, Brynn decides to call in her Grams' estranged younger sister, Aggie, a former bounty hunter. Can the girls learn to trust one another, follow their instincts, and get Granny Winnie out of jail? Or will Brynn be destined to spend her last year of high school alone in the small town of Copper Cove? To ask other readers questions about Seaside and Homicide, please sign up. I absolutely loved this book. Grams is hilarious being sarcastic and the comradie between Brynn, Peyton, and Raven was special. I was always bullied in school and this really hit home for me. I wish I'd have had that good of friends. I have always loved Jenna's books and now that she's taking the time to write with her stepdaughter is awesome. I can't wait to see what happens next. 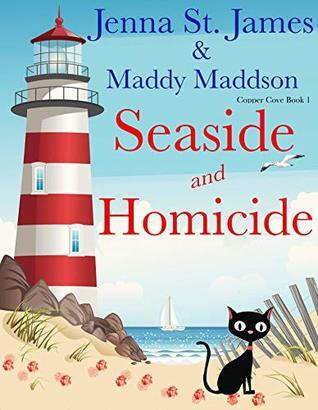 Seaside and Homicide is the First Book in the new Copper Cove Book Series. This book is written by Jenna St. James and her stepdaughter Maddy Maddson. This young lady has a great future as a writer! I really enjoyed the story and the characters. I enjoyed reading about the high school seniors Brynn and Peyton and their discovery of a body during the Copper Cove Festival. There are other great characters and I just love Granny Winnie! The mystery I did not guess at all. This book was hard to put d Seaside and Homicide is the First Book in the new Copper Cove Book Series. This book is written by Jenna St. James and her stepdaughter Maddy Maddson. This young lady has a great future as a writer! I’m a character type of person. Yes, the mystery has to be a good one, (this one is), but if the people don’t interest me, I move o This is the first book in a new series by a new power writing team. Jenna St James is an author I found last year. She quickly became one of my favorites. Maddy Maddson is her teenage stepdaughter. This is Maddy’s first book. I’m already looking forward to more by her. I wasn’t certain if this book would appeal to me being YA but curiosity won out. I’m happy it did. A great fast read about three teenagers and the murders that occur in their small community. Okay I did guess part of the solution but I must admit that I didn't see the other part coming at all. Nice plot full for great characters - who are all different but together make a great read. This was a great 1st book in a new series. When Brynn and her best friend, Peyton, find the dead body of the town busybody, evidence points to Brynn's grandmother, everyone suspects her. It's up to Brynn, Peyton, and their new friend Raven, to prove the town wrong. Could not put this book down!!!!!!! From start to finish Seaside Homicide introduces three fun and intriguing teenage sleuths! Brynn, Peyton and Raven have so much fun!!!!! The mystery was fast paced and kept you guessing!!!! The relationships and family are what make Copper Cove so wonderful. Ladies you both wrote a great book!!!!!!!!!!!!!!! I've been a fan of Jenna St. James's books for awhile and was excited to hear that she was collaborating with her stepdaughter on this one. I was not disappointed. Jenna writes in the genre of cozy/women's literature. Her humorous characters and stories revolve around over-the-top family members, creative murders, and there's always a positive element of the military in her stories. Jenna currently lives in Missouri with her fiancé, step-daughter, Nova Scotia duck tolling retriever dog, Brownie, and her tuxedo-cat, Whiskey. She is a former court reporter tur Jenna writes in the genre of cozy/women's literature. Her humorous characters and stories revolve around over-the-top family members, creative murders, and there's always a positive element of the military in her stories. Jenna currently lives in Missouri with her fiancé, step-daughter, Nova Scotia duck tolling retriever dog, Brownie, and her tuxedo-cat, Whiskey. She is a former court reporter turned educator turned full-time writer. She has a Master’s degree in Special Education, and an Education Specialist degree in Curriculum and Instruction. She also spent twelve years in full-time ministry. When she’s not writing, Jenna likes to attend beer and wine tastings, go antiquing, visit craft festivals, and spend time with her family and friends. You can friend request her on Facebook at https://www.facebook.com/authorjennas... or catch her on Instagram at http://www.instagram.com/authorjennas.... Check out her website at http://www.jennastjames.com/. Don’t forget to sign up for the newsletter so you can keep up with the latest releases!